Like every other country, we have our rock stars. Thank goodness for that. Imagine not having any at all. 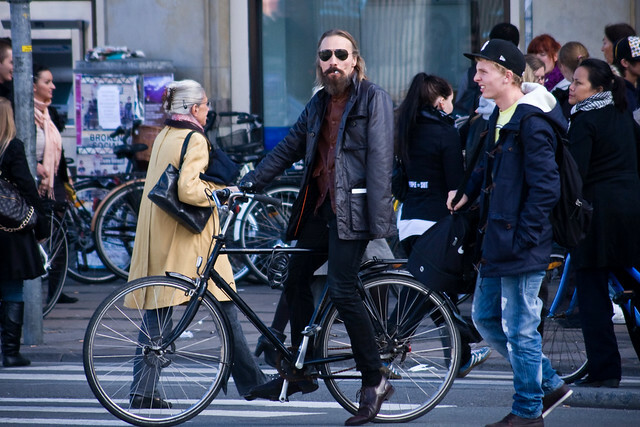 I spotted Steen Jørgensen in the city centre the other day, riding his bicycle like any decent Copenhagener. He is the lead singer in the band Sort Sol [Black Sun] which was a legendary punk band before moving into post punk, goth, and industrial music. The man is, in my opinion, outrageously cool and everything a rock singer should be. The fact that he only has one arm doesn't stop him from riding around Copenhagen on his bicycle, smoking a cigarette. Excuse me but cigarettes are not cool at all! Not chic nor stylish and definitely out of fashion! Now you need to get a photo of King Diamond on a bike. I hate to break this to you, but you were not even nominated for Arbitrator of Cool. Your post does seem to have put you in the running for Squaresville, Man though. Disclaimer: I personally find cigarettes obnoxious, but do not let that allow me to believe that I am the arbitrator of cool either. Steen Jørgensen, cigarettes, Copenhagen and cool - FTW.